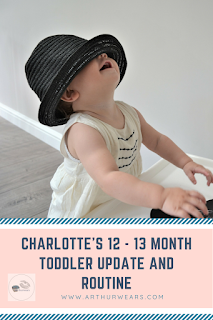 Charlotte has just turned 13 months, so I thought it was about time I did a blog update for her as I did a 12-13 month toddler update for Arthur! 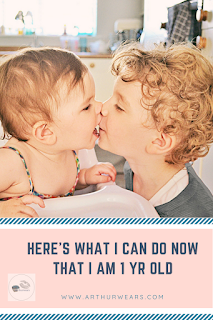 (Complete Mum guilt if I don't, let's be honest!) It was lovely to look back at his and see the similarities, plus read about a lot of things I had forgotten...but thought I never would! Wakes up - When Arthur wakes her up - usually between 5-6am, but I usually manage to get her back to sleep for a little while. If left to her own devices I think she would usually wake naturally between 6.30-7am. She still wakes regularly throughout the night to breastfeed and co-sleep, but usually nods off quite easily after some milk once she is in our bed. The evenings when she is in her own cot are the hardest to keep her asleep - she doesn't like being alone. Charlotte is a real milk monster and unlike Arthur at this age, she still likes to have a few milk feeds during the day too. I have always fed on demand and the World Health Organisation recommends breastfeeding until at least the age of two. 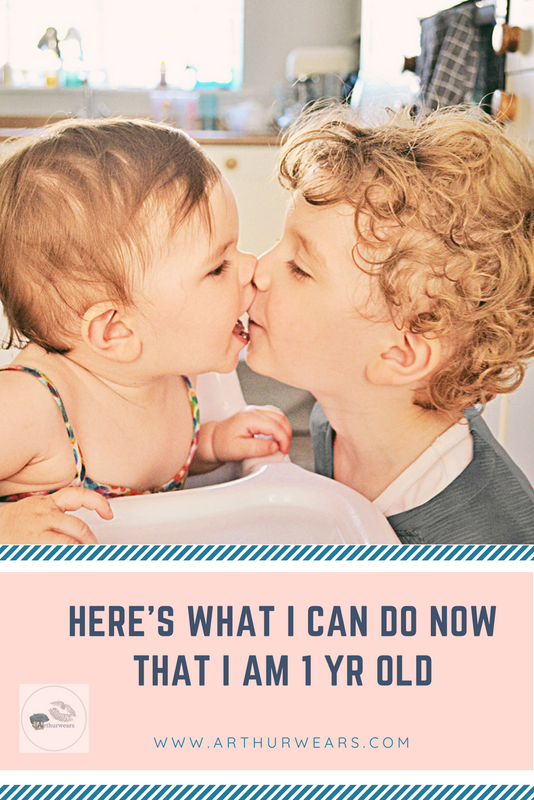 It can be very common for toddlers around the 12 month mark to suddenly want to breastfeed more as a way of reconnecting and adjusting to developmental leaps and this is something I found true for both of mine. Breakfast - 6.30-7.30am - usually toast with dairy free spread, cereal with oat milk and some fruit. Nursery run - 8.45 - 9.30am - often Charlotte will fall asleep and have her first nap about now if she has been woken early. Lunch - 11.30/12 o clock - when Arthur is an preschool, I will often do Charlotte a 'snacky' lunch (dairy and soya free) with things like eggy bread, smoked salmon, corn on the cob, olives, vegan cheese chunks, sweet potato chips, mashed sardines on toast etc followed by some fruit and/or koko yoghurt. Nap 2 - usually between 1.30pm and 2.30pm if she's had an early nap in the day. If she had a later morning nap then sometimes she skips her second nap. Naps are now in her pram/pushchair as it is the only place she will settle easily, due to the harness restraints so that she can't keep standing up and with the hood fully down to stop any distractions. She has a dummy for sleeping but she will often take this out once she has settled. Playtime - until 4.30/5pm - If Arthur is at preschool will we have to go and collect him for 3pm aswell. Dinner - 4.30/5pm depending on how hungry they are! This usually consists of a pasta dish of some sort, they both love spaghetti with king prawns and broccoli, or the traditional Italian pasta soup dish of mini pasta in a chicken broth. 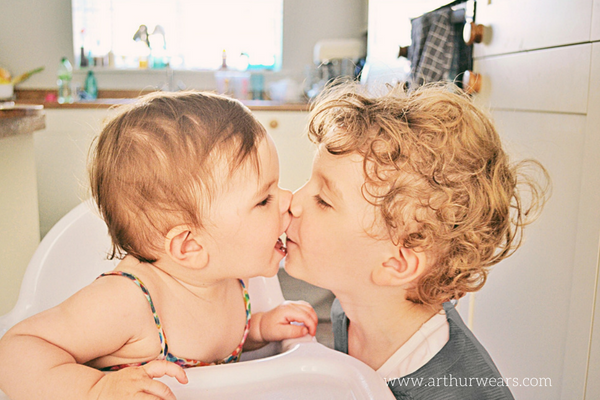 Bathtime - 6.30pm - both Arthur and Charlotte are bathed together. 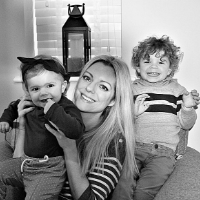 Ready for bed - I get them both ready for bed and if I am on my own, then Arthur goes downstairs and watches some TV whilst I get Charlotte to sleep, and then when she is asleep I start the bedtime routine with him afterwards. Charlotte's routine - milk, cuddle, bed whilst I pat/stroke her. Sleep - I aim for between 7.30pm - 8pm depending on how long it takes for her to fall asleep! Night waking - Like her brother, Charlotte has never really slept through the night and wakes regularly, particularly when teething or unwell. She often co-sleeps for the last half of the night as this is the best way for us all to get the most sleep! I used to think it was just us, but this is a lot more common than you may think! If your child is the same, you are not alone. We feel very lucky to have the happy, sociable, active child that we do during the day - we have come to accept that for now, this just comes as part of the package! 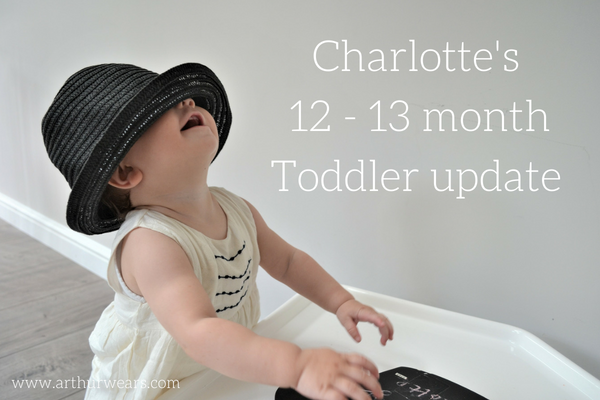 Charlotte has been walking for a couple of months and is getting much more confident with this now. 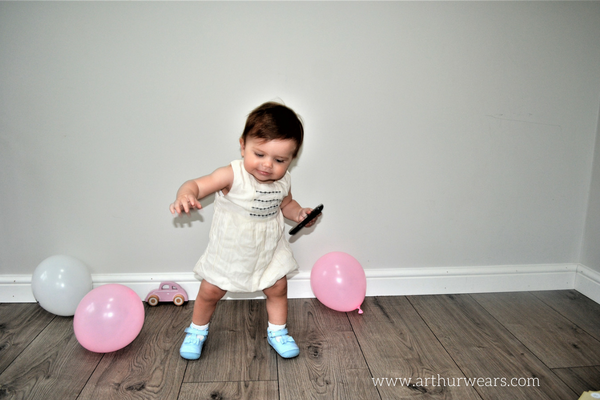 She is now learning other skills whilst walking such as kicking a ball and dancing. She is obsessed with her shoes and wants to wear them ALL the time, pointing saying "shhhs". She loves to brush her teeth and will often sign for her toothbrush and then pass it to me to wash when she is finished (don't worry, we give them a good brush too!). She tries really hard to communicate her needs and will sign for food or water when she is hungry or thirsty, asks for a bib when she is in her high chair and signs 'enough' when she is finished. She signs for 'milk' frequently! She understands her daily routine and when she wakes in the morning she will climb over to her Daddy and sign for and say 'nah pah' (nappy) for him to change her nappy ready to start her day. Feeding herself - Charlotte can occasionally be fussy with food and she prefers to feed herself, although will ask for help if it is something she loves and is desperate to eat it! She always requests cutlery as she loves to watch Arthur eating his food and likes to copy what he does. Charlotte is still dairy and soya free. ice lolly - " aye lohloh"
Understanding - Charlotte is now starting to understand a lot more. For example, if I sign and say "food time" or "bath time" she will make her way over to the door ready to go. She will attempt to put shoes and socks on/near her feet. After her evening milk I will ask if she wants a cuddle? She will snuggle in and say "ahhh". If I ask if she wants to go in Charlotte's bed she will either shake her head (if she isn't ready) or point to her bed if she is happy to lie down. At nap times I will suggest it is time for a sleep in her pushchair - she puts her dummy in and waits by the gate pointing to the room with her pushchair. She then asks for her hat (current obsession) by patting her head. Charlotte loves peekaboo games and she has favourite books which she will bring over and sit on my lap ready to read. At the moment she enjoys a small book with animals and their related sounds...she anticipates the page with the lion where I will 'roar' and the page with the dog where I will 'woof'. Making relationships - Charlotte is very affectionate and also very sociable. Once she feels secure, she enjoys attempting to communicate with others and always offers kisses and cuddles when she says goodbye. 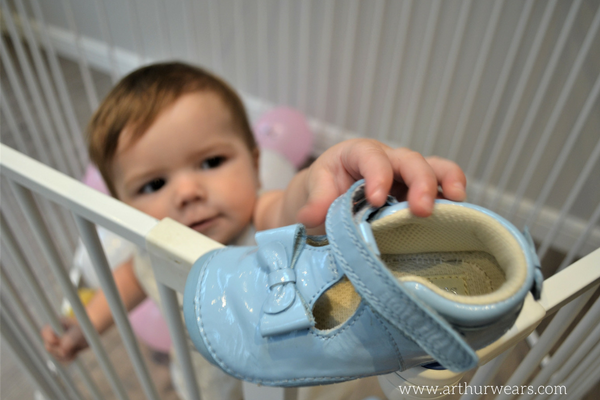 She has a lovely bond with Arthur and always wants to kiss and cuddle him before bedtime and looks forward to seeing him after they have been apart. 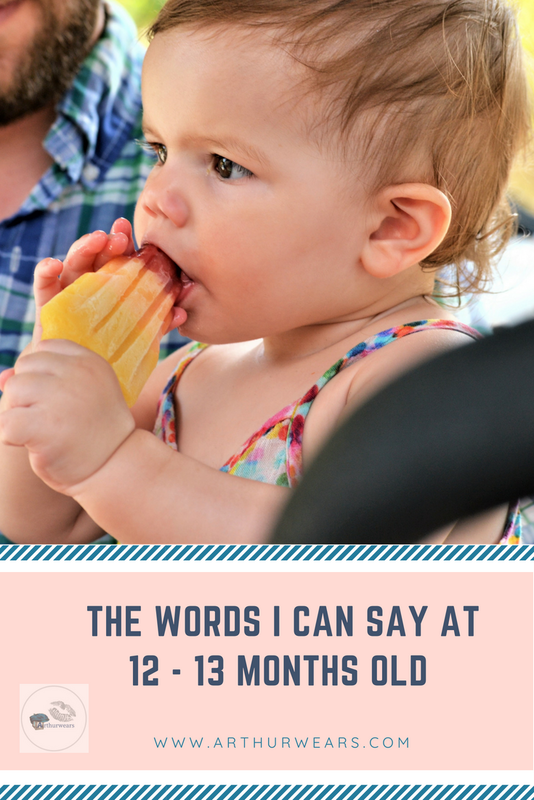 We have started to notice that when we give Charlotte something she really enjoys (like an ice lolly!) she offers kisses as if to say thank you. Technology - A contentious issue for young children, but something I think is important in today's changing world! The EYFS technology strand for children aged 16-26 months states that children should be able to " anticipate repeated sounds, sights and actions eg: when an adult demonstrates an action toy several times" and " shows an interest in toys with buttons, flaps and simple mechanisms and beginning to learn to operate them". 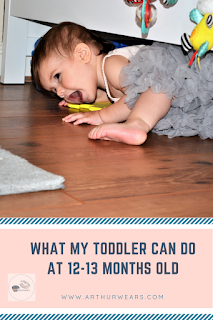 - I think most of us will agree that many children learn these skills before this age simply due to the nature of the toys and products for babies available in today's market. I also think it is important to make technology real and meaningful for children so that they are able to make connections with real life objects. 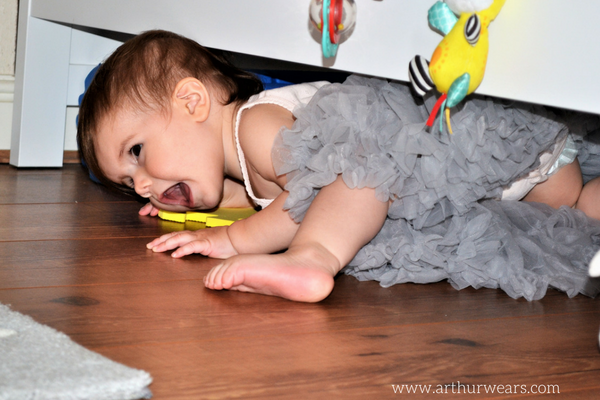 Therefore, although like Arthur, Charlotte does have a toy phone and remote control, we do let her handle real ones. Technology isn't just as simple as a phone or a laptop - most of our everyday household items use technology and your children will usually be learning all about them just by watching you! 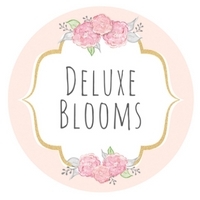 For example: cameras, hoovers, washing machines, coffee machines, TV, remote controls etc. The only time technology should be something to worry about is when you are using it to excess or using it to replace other important activities such as using TV instead of reading a book etc. So there we go...I'm sure I've missed quite a few things out, such is baby brain! At least if they look through my blog posts when they are older, then one of them isn't going to feel left out!